There are no non-surgical treatments that can successfully treat a hernia. The only option for healing a hernia is to close the hernial opening surgically. The surgical treatment of hernias is one of the most common procedures in Germany and is a routine procedure for specialist surgeons. 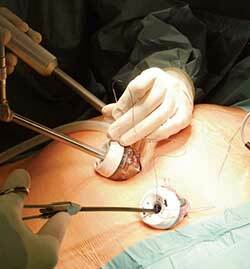 Until recently hernias were operated on exclusively using the open technique. The hernia was exposed using a skin incision about 15 to 20 cm long. To ensure that the relatively large scar heals well and to prevent the hernia recurring, the patient had to avoid physical exertion for several weeks after the procedure. These days there are considerably less stressful procedures. The hernia defects are closed up using special plastic meshes without applying any tension. This shortens the time until the patient has completely recovered after the surgery. Patients can generally return to their normal physical activities just a few days later. The risk of a repeat hernia (recurrence*) is also considerably lowered. For the minimally invasive surgical technique, a small camera and the surgical instruments are inserted through a tiny incision in the abdominal wall. Along with less pain and smaller scars, keyhole surgery has the advantage that patients can return to their everyday lives more quickly. If the hernia defect is closed with a suture, there is a risk of about 50% that a repeat hernia (recurrence) occurs because the suture is under considerable tension. The insertion of a plastic mesh reduces this risk to a minimum. 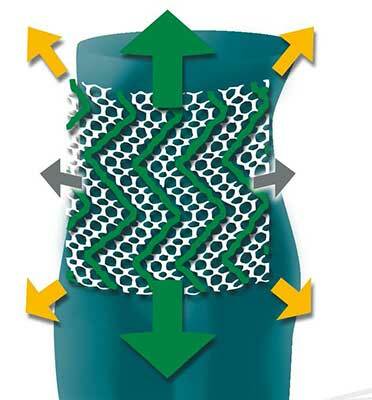 The mesh closes up the hernia without any tension and provides additional stability. 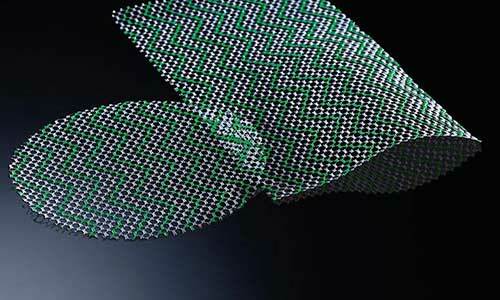 Choosing the right mesh is therefore a critical factor for a successful outcome for the surgery. Modern meshes act like healthy abdominal wall. Despite their extreme tear resistance, they remain very elastic and conform to all the body’s movements. Large pores ensure that the body’s tissues grow through the mesh and create a stable connection between the body and the mesh.